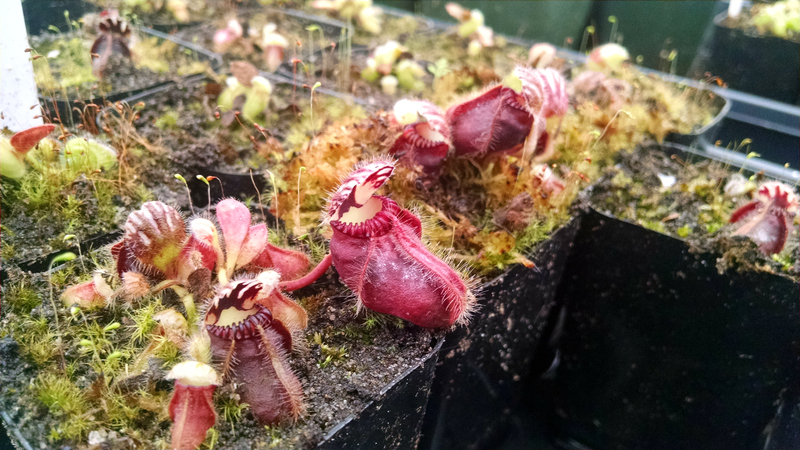 Field Trip: Funny stuff at Predatory Plants |Sundews Etc. Yesterday I decided to go hang out in San Francisco with my friend Josh, owner of Predatory Plants. I thought I'd head home early to beat the commute traffic, but unfortunately the commute traffic got started around 1 pm, so I ended up sitting around his greenhouse checking out all the weird stuff he's got around (and also catching up on all the carnivorous plant gossip). 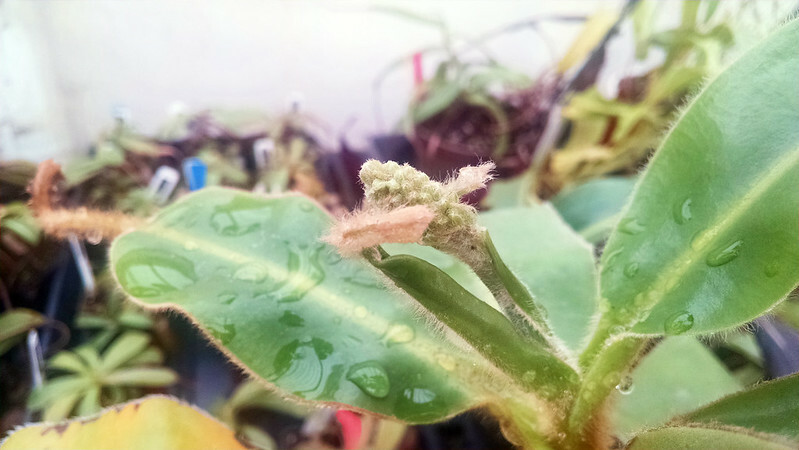 This Nepenthes glandulifera flower stalk looks like a certain other prized inflorescence. This plant is so fuzzy it's ridiculous. The clump of Drosera omissa × pulchella is just about to attain sentience. Be careful of pygmy hybrids. 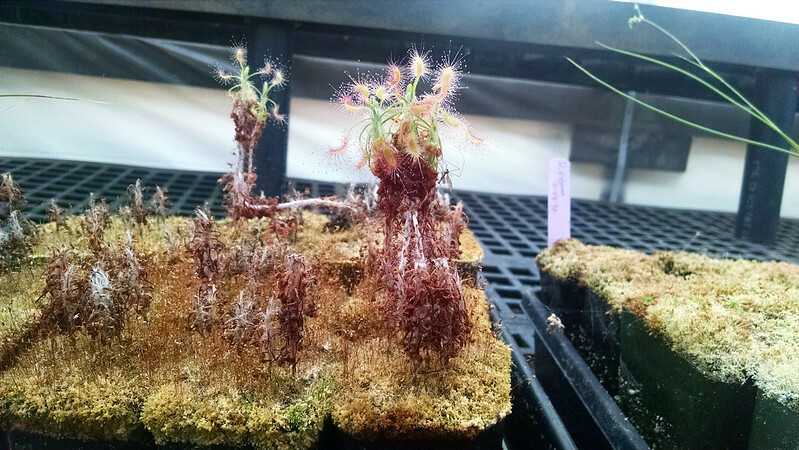 Meanwhile the Drosera scorpioides are looking quite Dr. Seuss-like. I correctly guessed that these plants are three years old. It's fun having extremely niche expertise. 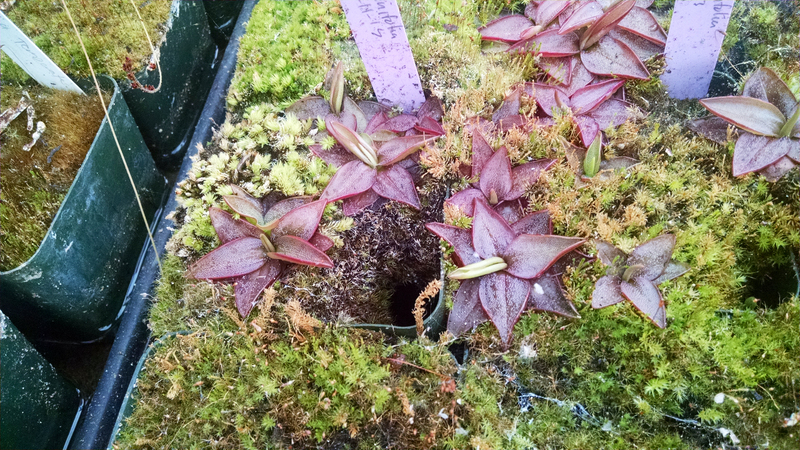 Josh discovered something funny about his pots of Pinguicula planifolia. They're attractive plants, just baffling. See that hole in the pot? It's hollow underneath. I guess in the two-plus years these have been growing here the bottom layer of soil has gradually been washed away, while the top is held together by the moss. Josh says he's afraid to mess with it now, since the plants seem to be fine. 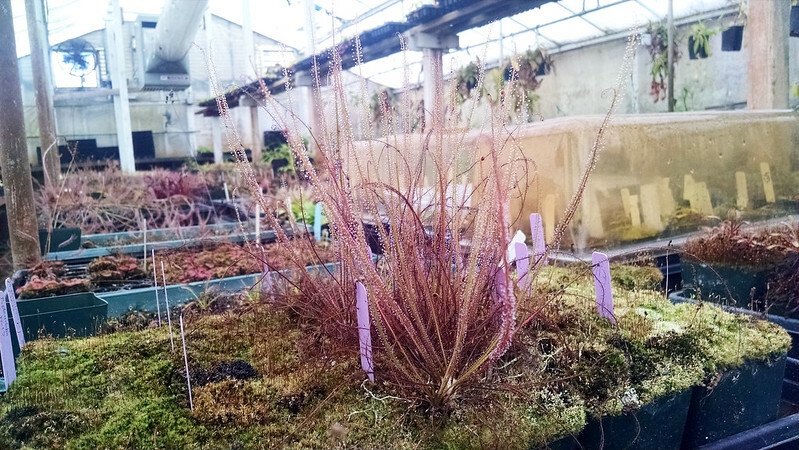 I had to stop to admire this fine patch of Drosera filiformis Florida red. I love this plant. Great color. These are around two years old. 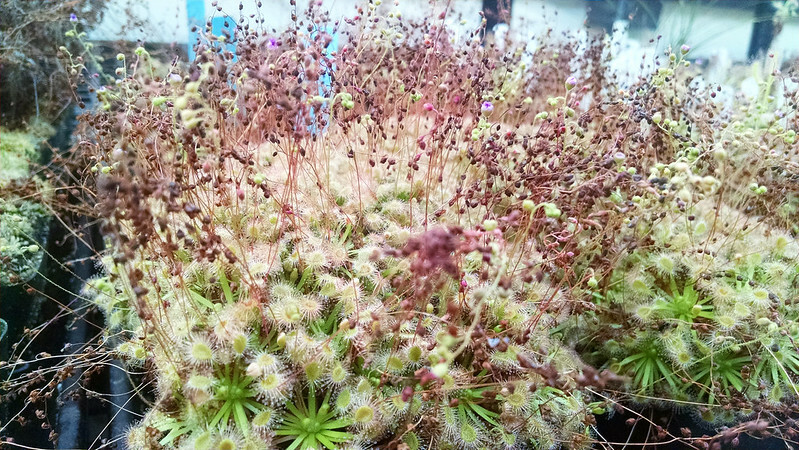 Really lovely plants! I wish mine would get a move on and start filling out. Also, Josh recently got into growing Cephalotus, and the results are looking pretty good! Everybody loves Cephs. If there was more of a consensus on how to grow them (and an easier way to produce them) I'm sure they'd become one of the most popular plants in cultivation. Towards the end of the day Josh was planting up some Drosera hamiltonii to a larger tray. For every plant he repotted he got a root cutting to start a new one. It's a very efficient system. 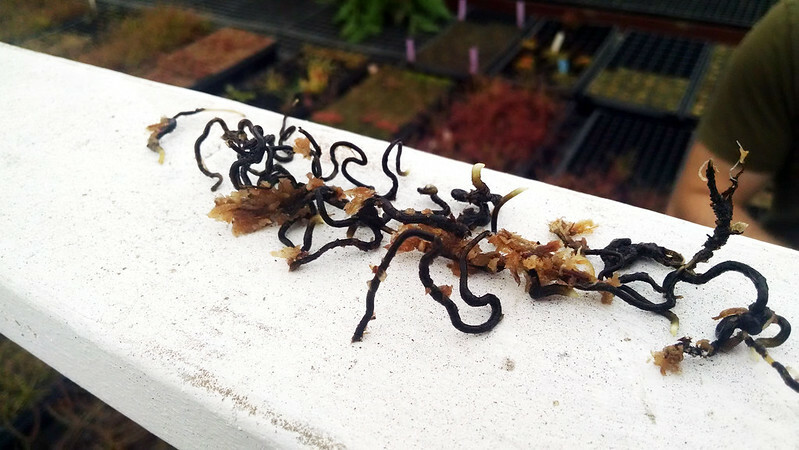 Those are some good-looking roots. Seeing all those D. hamiltonii made me want to check in on my own when I got home. They're looking great! I love seeing the new leaves unfurling. This is definitely one of those species where the less you mess with them the better they look. I think I spotted a root or two creeping into the tray though. I should get some propagation going. Look at those plants! Wow! 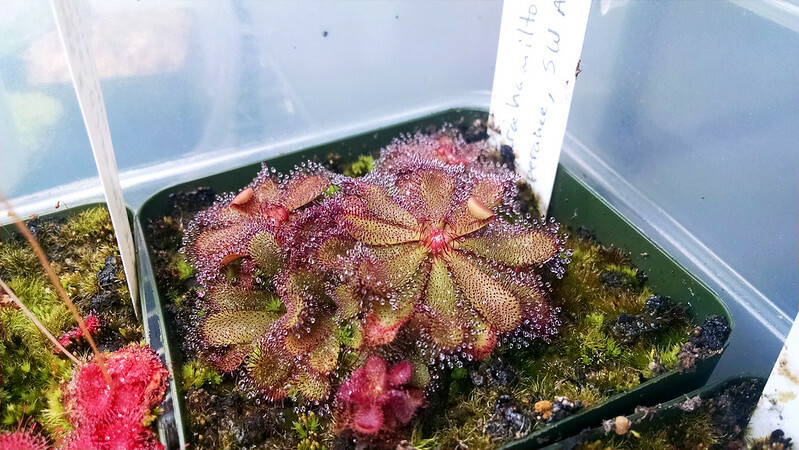 Your D. hamiltonii look amazing! I had a couple, but, sadly, they passed. Once I get Cephs right, I think I'll pick up another one and pot it with the Cephs. I saw a little Ceph set-up once with a bunch of natives and it looked really neat. Those Dews Josh has are so concentrated! That's really incredible! I would love to know more about how you care for D. hamiltonii. I just recently obtained one about a month ago. I hear they can be quite picky. 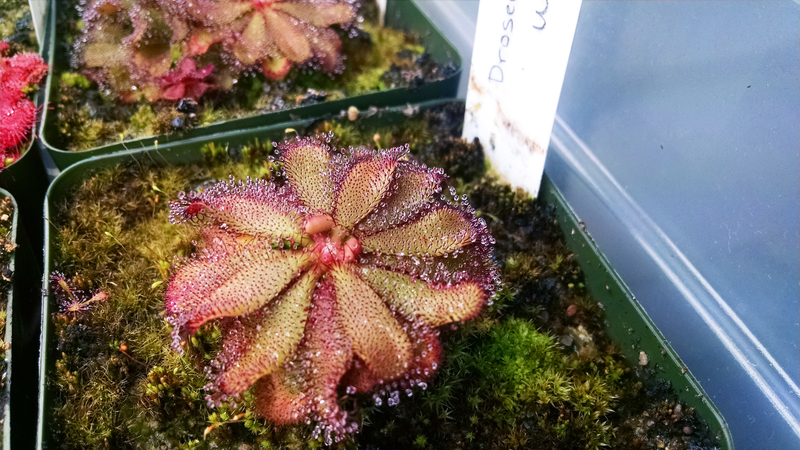 Honestly, D. hamiltonii isn't all that different from my other sundews, with the exception that they are a lot slower to bounce back from any disruption. When I've fed them they will eat happily, but they lose all their dew for weeks afterwards. Also, there have been a few instances when they just start looking terrible for a while for no reason, and then get better. Just be a bit patient with them and it should be fine.